The Times page 1 is of January 18, 2017. Negotiations between the United Kingdom and the European Union about Brexit were just beginning. 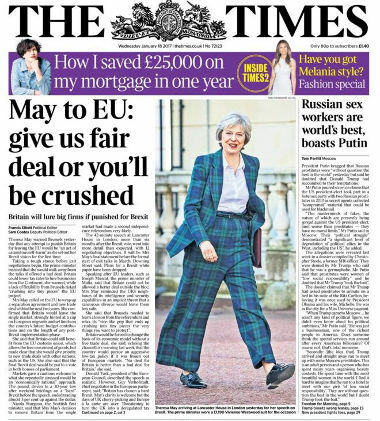 The “you’ll be crushed” arrogance in the headline characterizes the attitude the British government under May demonstrated during the talks. Theresa May has said she “sincerely hopes” the UK will leave the EU with a deal and she is still “working on” ensuring Parliament’s agreement.Arriving in Brussels, she said that she had “personal regret” over her request to delay Brexit, but said it will allow time for MPs to make a “final choice”. Meanwhile, Jeremy Corbyn said his talks in Brussels were “very constructive”. BBC Brussels correspondent Adam Fleming said Mrs May spoke to EU leaders for 90 minutes and was asked several times what her contingency plans were if she lost the third “meaningful vote” on her deal in Parliament. May asked the EU to move the hard coded March 29 Brexit date to June 30. 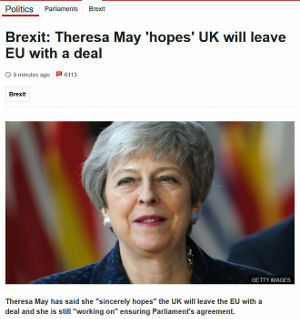 She may be given May 23, the day of EU elections, as a compromise but only if her deal passes the British parliament. A no-deal crash out on March 29 would create utter chaos for months. It would be catastrophic for Britain’s economy. May’s withdrawal agreement was already voted down twice. If it comes to a third vote in parliament it is very likely to fail again. Article 50 is the part of the British withdrawal law that governs the Brexit process. If May revokes it, there is little chance that another Brexit attempt will ever be made. The majority that voted to leave the EU will have been betrayed. [W]hile EU leaders have ruled out re-opening the Brexit withdrawal agreement and the “backstop” text, you can bet they’ll discuss a longer Brexit delay at their summit today. This is, in my view, a misjudgment. Yes, under normal circumstances and with a competent and trustworthy negotiation partner on the British side, ways would be found to fudge the issue and to avoid a Brexit in all but its name. That is why I predicted long ago that Brexit was not gonna happen. But May has really done everything to affront the other side of the table. She did not stick to commitments she had given, delivered papers too late to properly discuss them, and came to emergency summits called on her behalf without anything new to offer. The leaders of other EU countries also have had it with here. The voters on the continent do not care about Britain. There will be no punishment for Merkel or Macron for letting Britain crash out. The EU will survive without the United Kingdom. With a no-deal Brexit the United Kingdom is likely to fall apart. Within a few years North Ireland would join the Irish Republic, peacefully one hopes, and Scotland would vote to leave. Is there a EU deal being made with the opposition leader and behind Theresa May’s back? Given that she is the Prime Minister how would that work out?